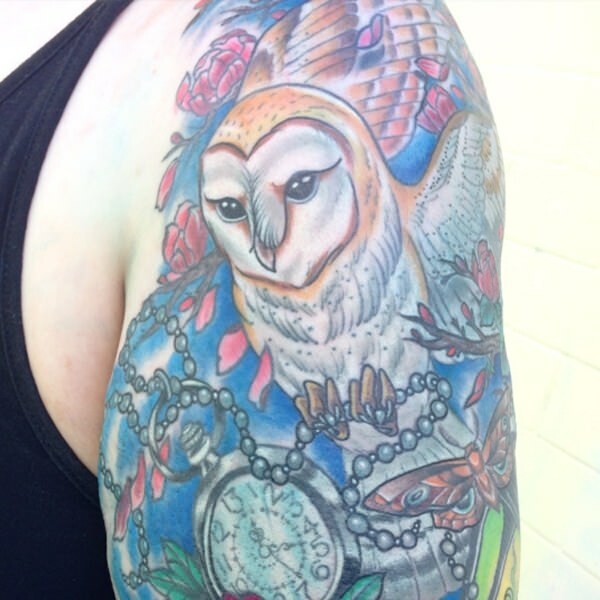 Tattoos might still be one thing that is frowned upon but that have not been stopping anyone from getting them chances are that most people you know have one or more tattoos. This is an expression of art or memories of loved ones. 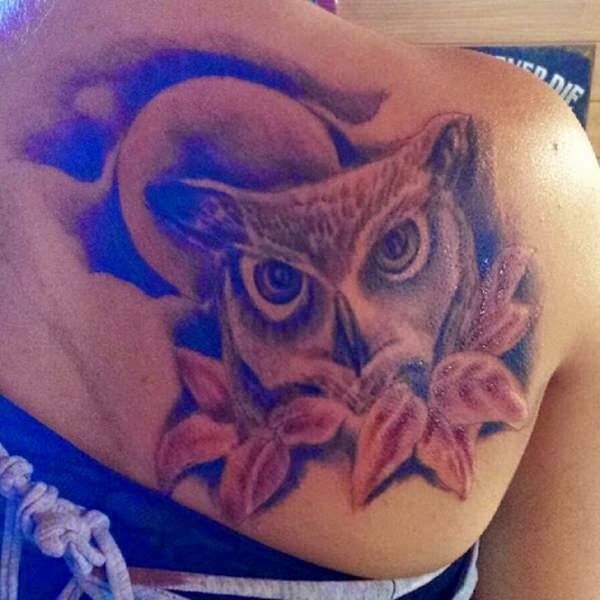 Finding the right artist is very important always ask to see some of their work and make sure they will be able to do the design you are asking because once they start to put it on your skin you cannot undo it sure you can cover it but if you get it right from the start it will be less hassle and less pain. 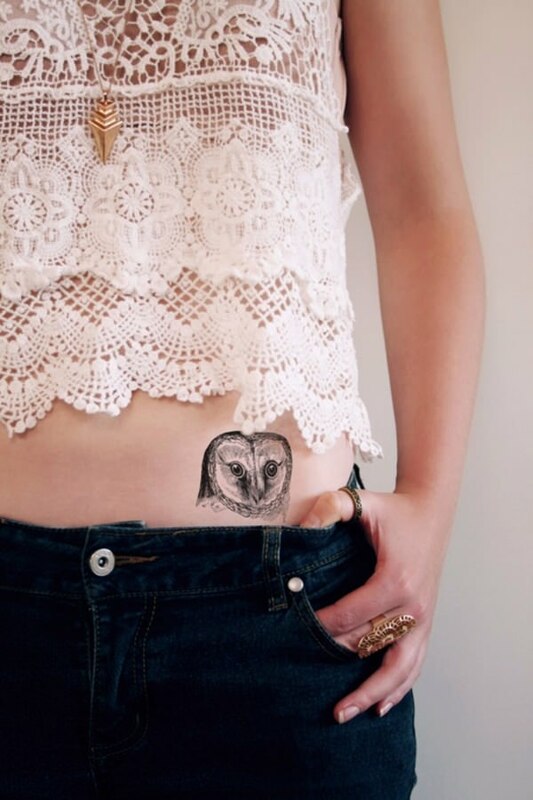 Owl designs have been quite popular the last few years owls have been said to symbolize wisdom or intelligence but if you don’t really care about the symbolic then you are amongst quite a few who just love the owl designs. 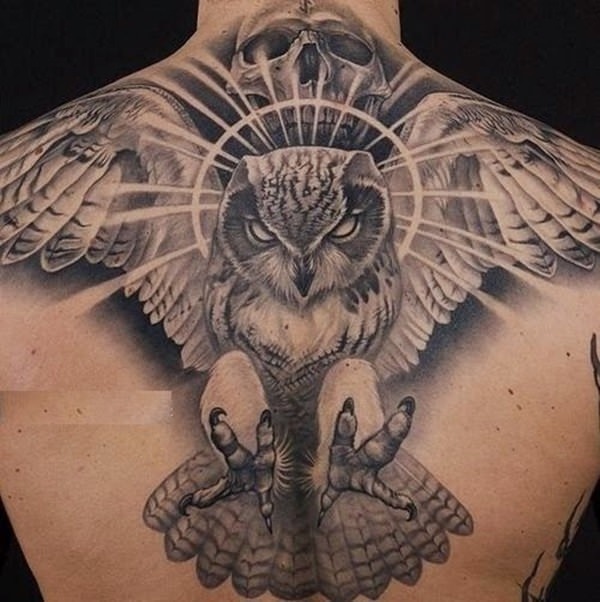 This design is amazing even if skulls aren’t your thing you have to agree that the detail and realism of this tattoo is just amazing this must have been a skilled artist that most possibly has been in the industry for quite a few years. 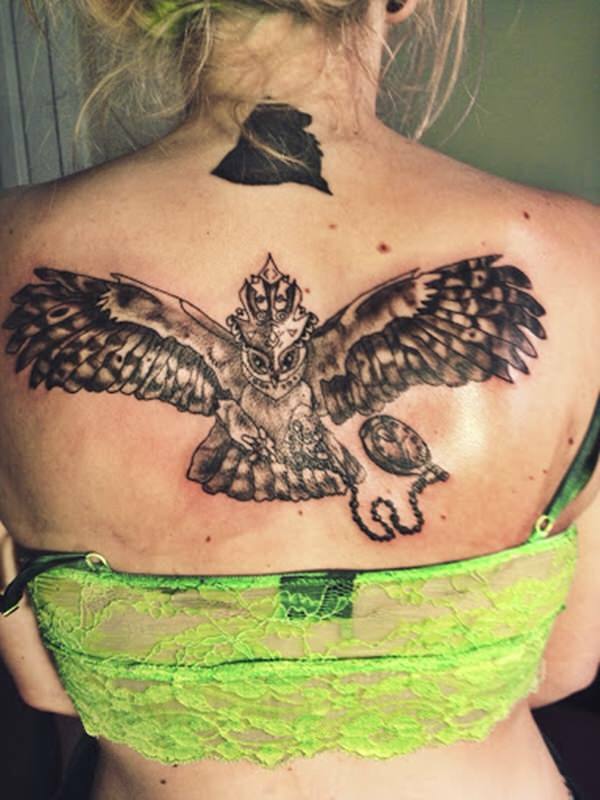 The design itself is powerful and beautiful and it is unique but this would’ve taken hours to complete and with the being near the neck I can just imagine how painful this might have been. 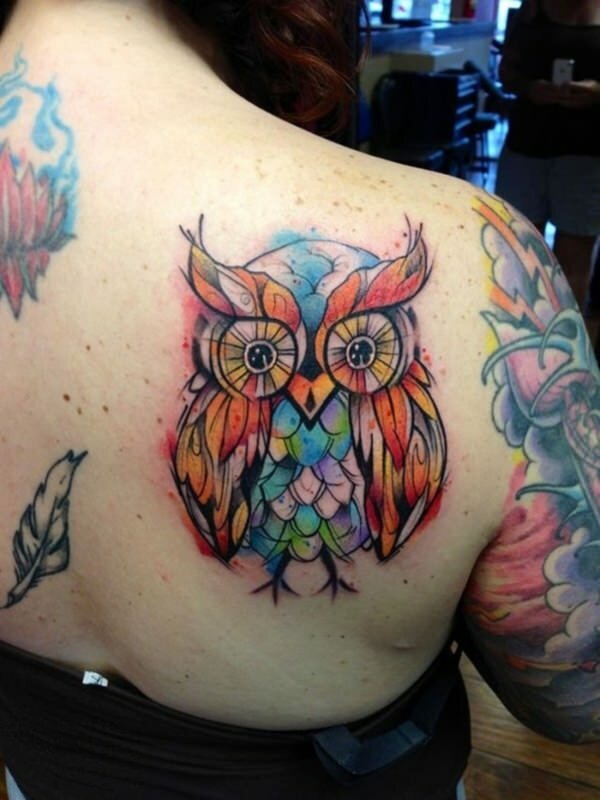 This makes a huge statement and the colours just makes it stand out and be a little more in your face. 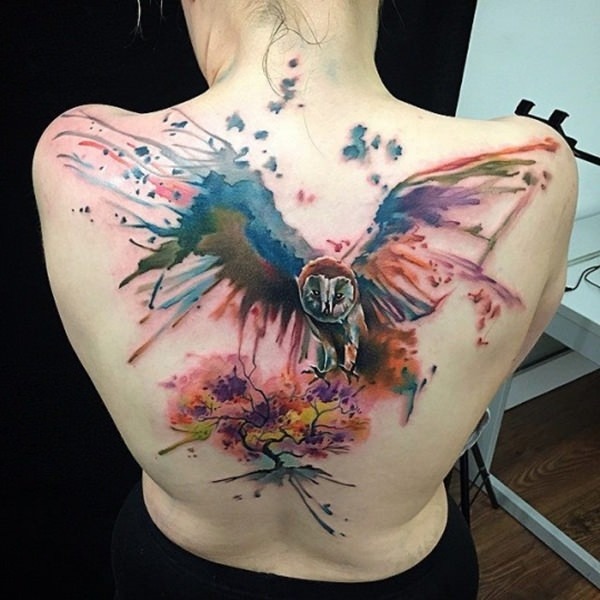 The colours looks so amazing and the work done here is great this was definitely not done in just one sitting due to that huge area that had to be filled and all the colours they had to use this must have been a lengthy project to complete but the end result is so amazing and the artist should be proud of this. 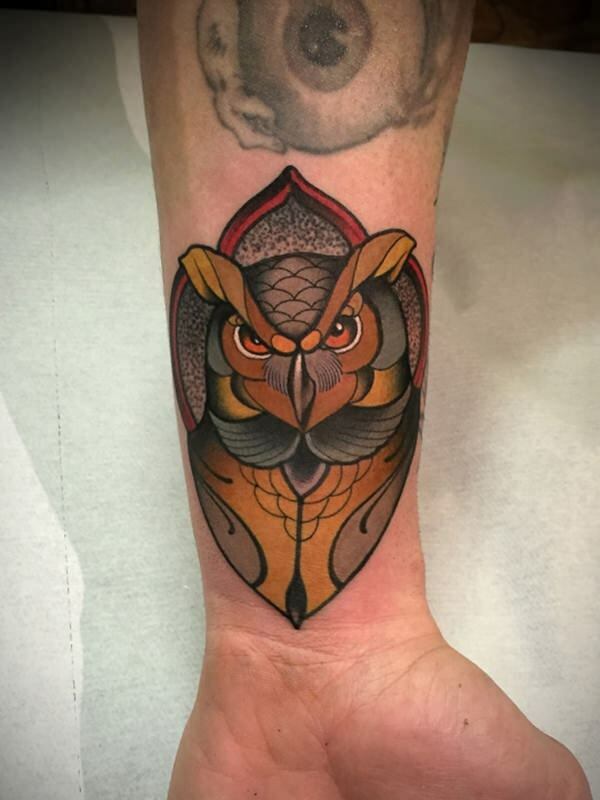 The colour of the ruby and the owl eyes brings this to live there is some great detail here and you can see this was not a quick job although the design itself is not huge it is still great and looks amazing. 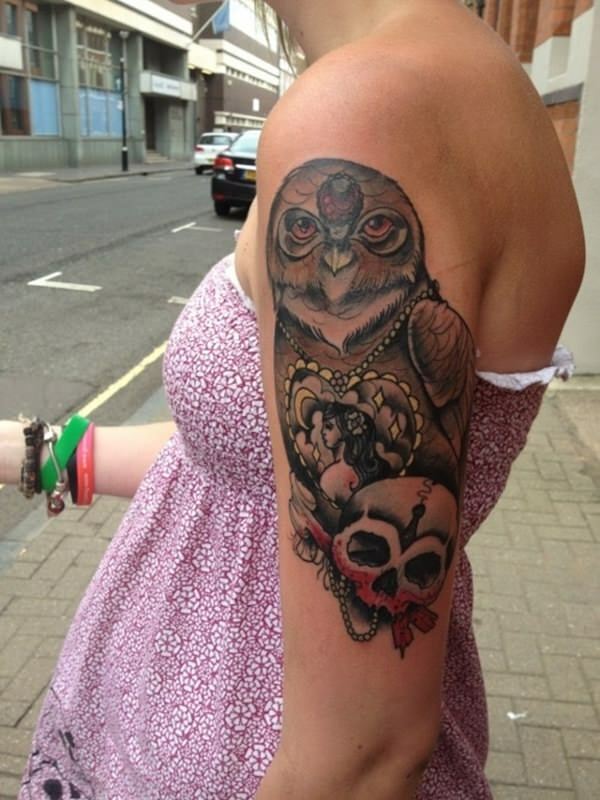 Okay so this is a design of an owl with a pocket watch and a crown or well it looks like a crown. 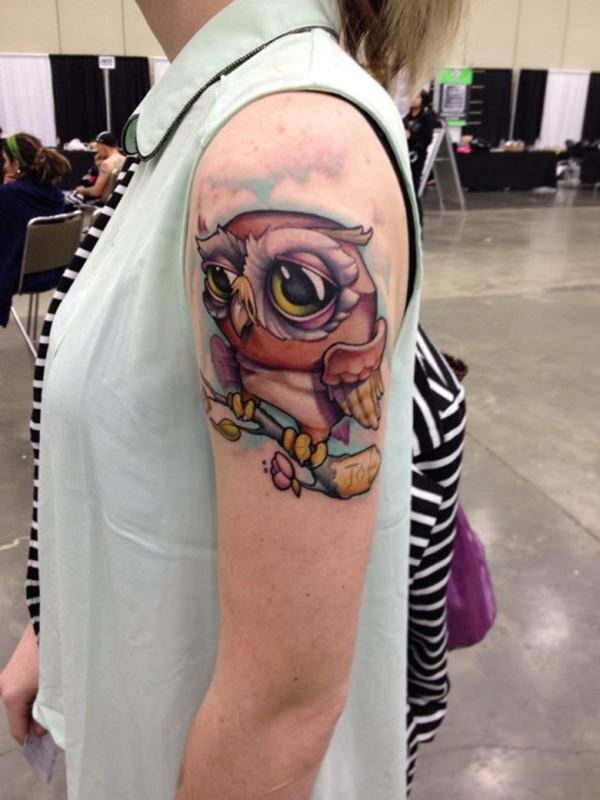 I am not sure if she wanted it this way or if the artist tried something new I don’t really like it but then again this photo might have been taken right after the tattoo was completed and to be honest my tattoos did not look amazing after they were done either they looked great after healing so maybe that will be the case here. This is eye catching the colours are amazing and the flowers add so much to this design I really like this one it does not look over done but it does have a lot of detail. 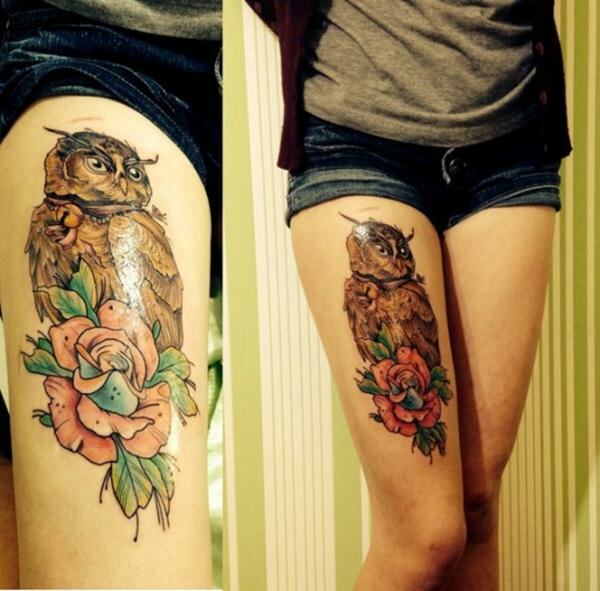 The owl looks amazing this is definitely one design that is not only unique but bright and beautiful as well. This is a design that not everyone might find interesting but I am sure it was well thought out it looks like a oil painting which gives it some unique features. 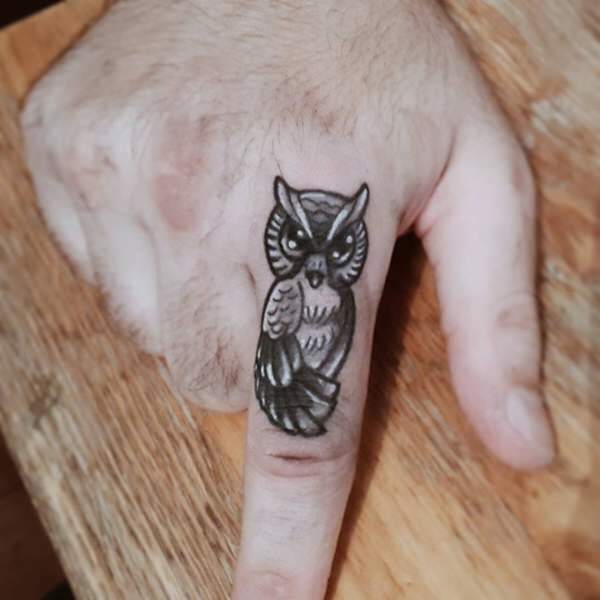 This is an idea if you like your outline tattoos but so not want to fill them in much this does look quite good but it is not a style that everyone will love but this also took quite some time to do and it is a big one to get. 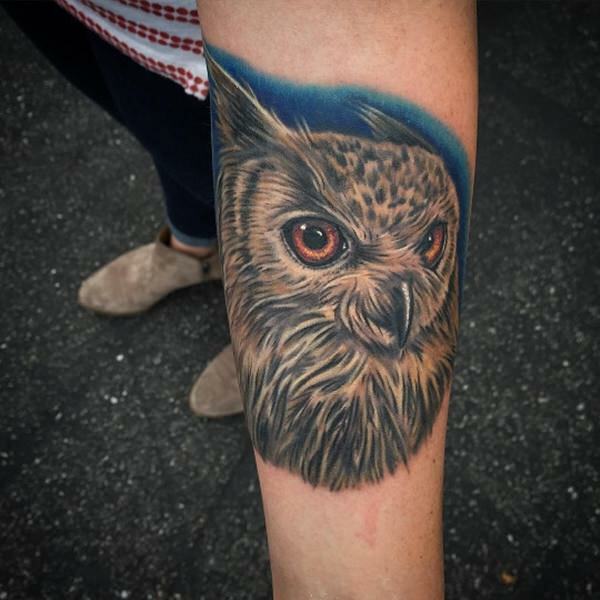 Wow this owl looks so realistic this artist is just amazing the detail and life like design is simply gorgeous if you want an owl tattoo why not get one that looks like the real thing. 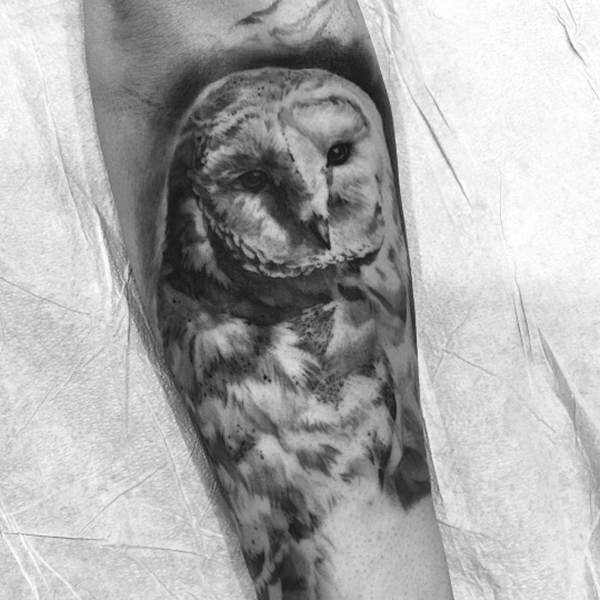 This is one that I think is nice and makes a statement it is not a big full size owl but you can still see that this is an owl and it looks like it is just peeking out quick the design might not be that beautiful but changing it a little bit might bring it to live that is the great thing with tattoos the design possibilities are endless and you can make it unique. This looks amazing it is so unique and the colours bring it to live, they eyes look so realistic it is just gorgeous. 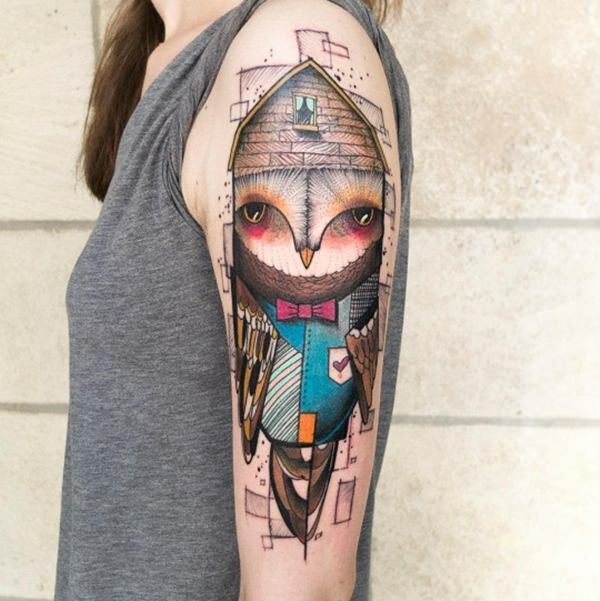 This is one of those very unique designs and to be honest even if it looks like a cartoon the detail work is done so well that it looks realistic well as realistic as cartoons can look but more the 3D effect especially the beak. 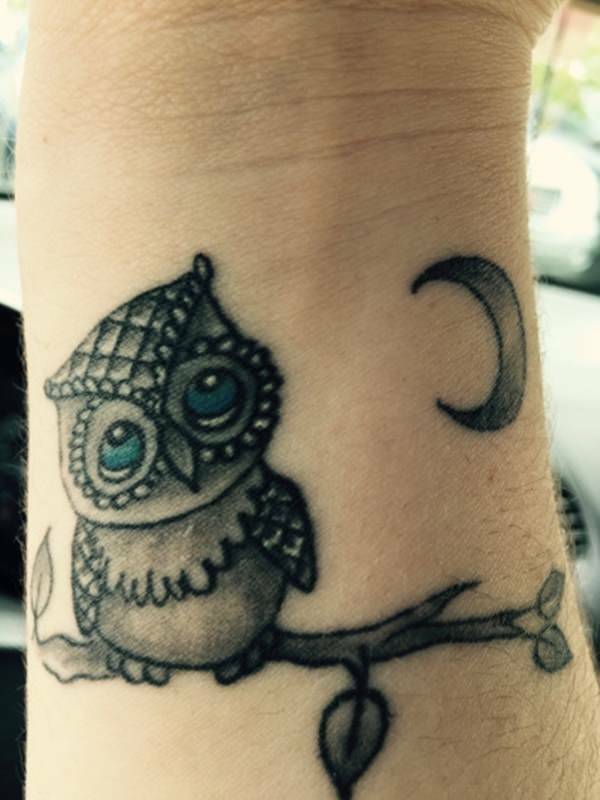 Is it just me or does this little owl look sad it has so much detail for such a small tattoo but truth is I love it maybe it is the fact that the owl looks sad while staring at something we can see he is not looking at the moon but at something. 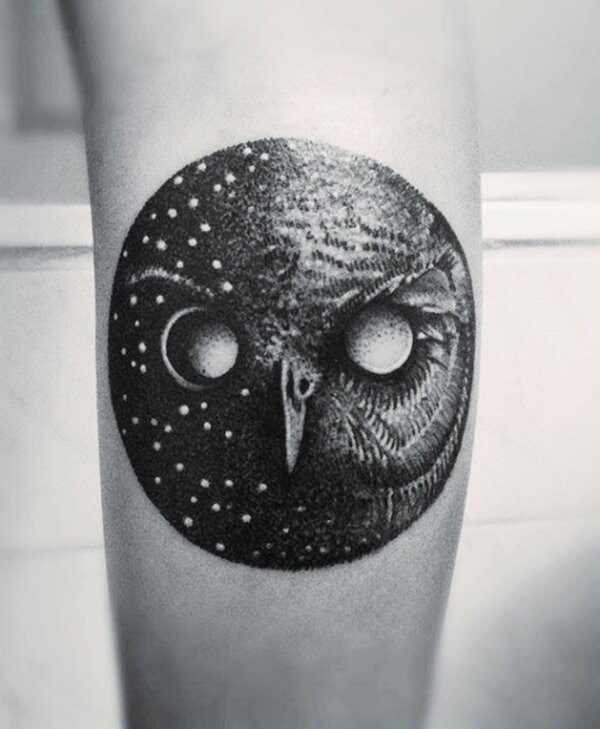 This could just be me but I am not sure what this owl is doing it kind of looks like a black blob with eyes sometimes if you get black tattoos and fill it in you can get an effect which makes the design hard to identify and I think that might be the case here. Whoever did this is amazing this makes such a statement it is gorgeous. 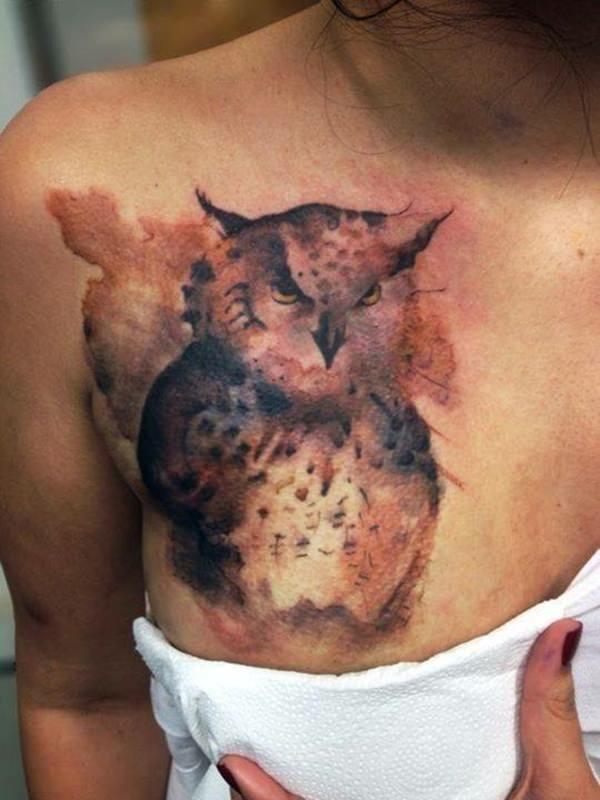 This would take so long to do but it is one of those tattoos that will leave everyone speechless. This looks like a drawing but yet it is beautiful the colours adds so much to this design. But here I will agree it is not for everyone at all this is a very unique design and it was probably designed by who ever is wearing it. This looks like one of the paintings you might find in someones home. It is done well and the flowers also looks great but I am not sure that I would even want this one against my wall. 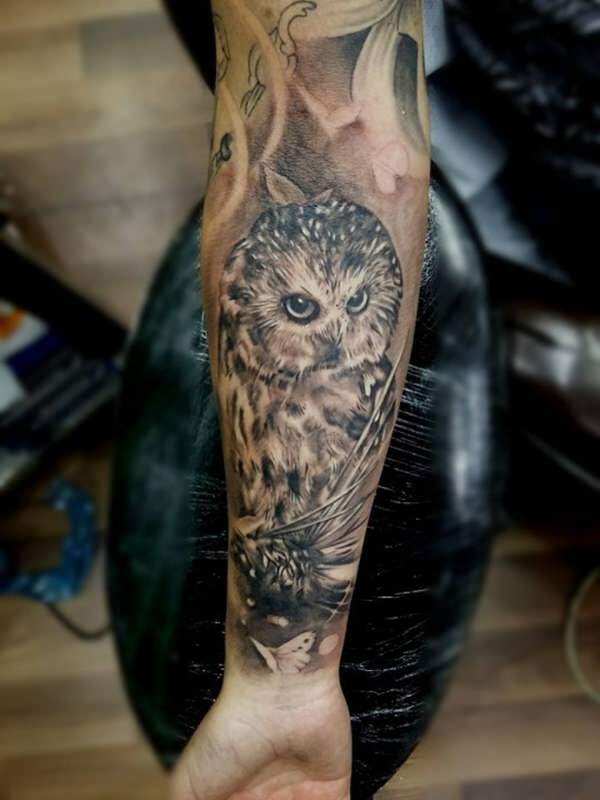 Okay this looks great it is something different that I can assure you not many people will have or even consider, The owl looks fierce but yet calm and the detail is also great. 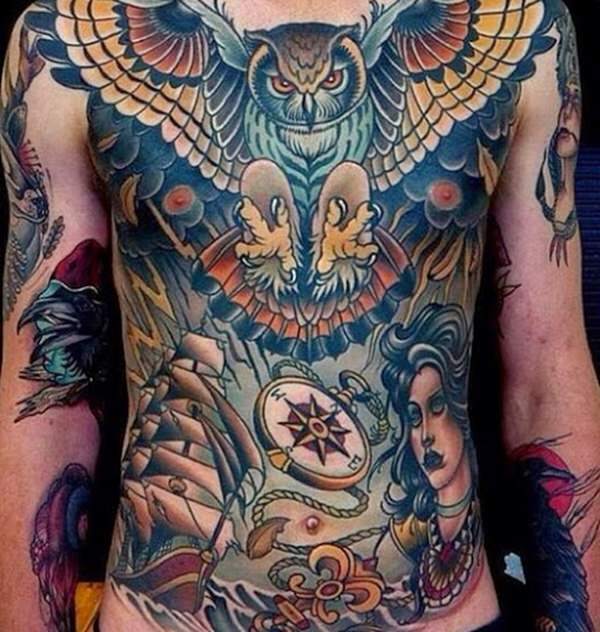 This is a bold and busy design with loads of detail and colour it is amazing and would’ve taken ages to complete but the end results are just awesome the colours work so well together. In a way this looks so peaceful and that might be the colour choices the detail in here is just amazing and the design is so beautiful. 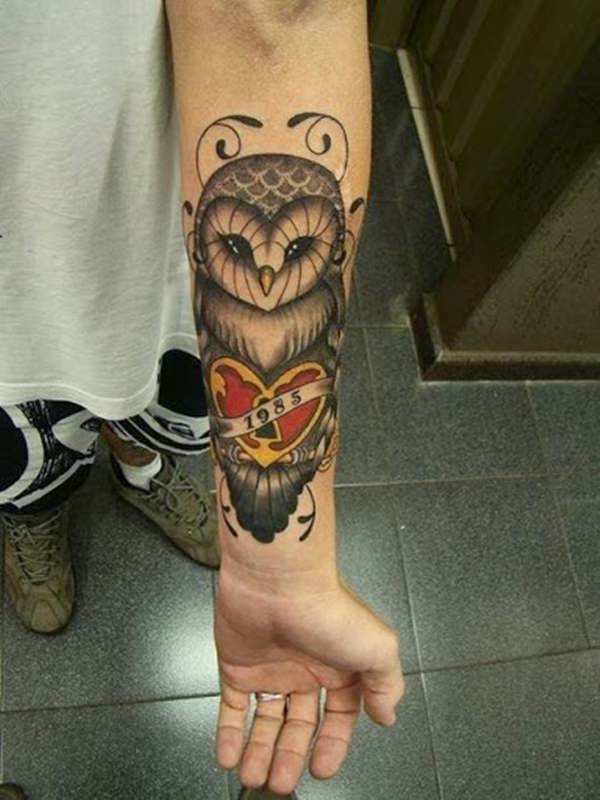 This is just such a great tattoo design. 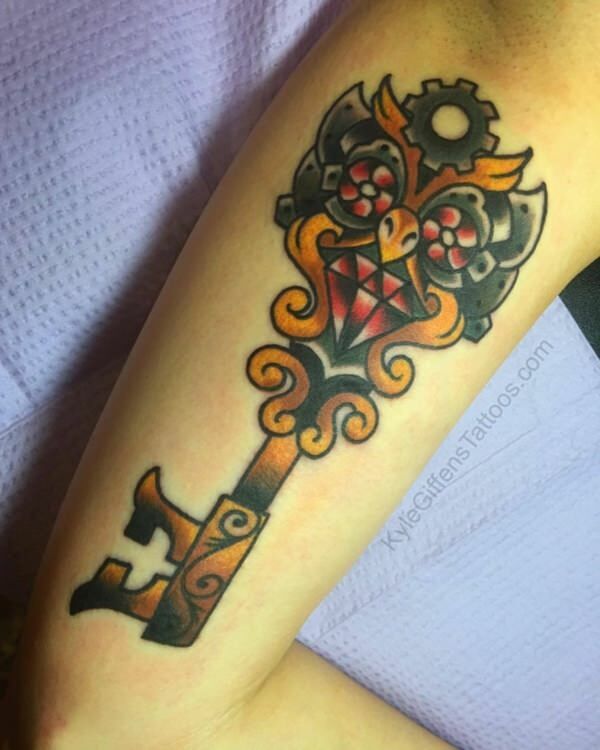 This design is interesting and very unique you can go look at the lines and colours this detail is not only good it is brilliant this is just a wow design just due to the detail you might not like the design but you will not be able to fault this detail. 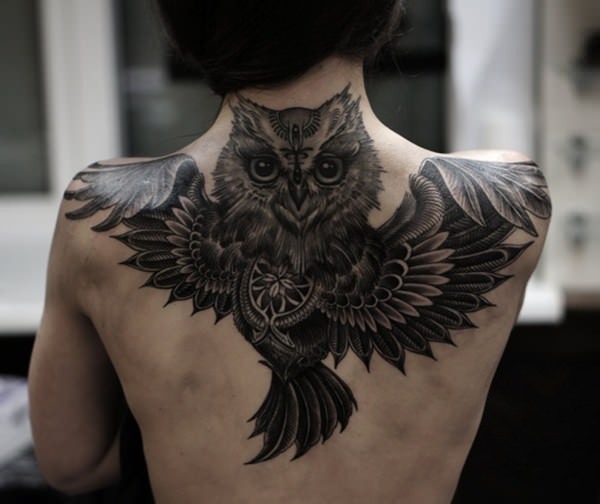 This is one of those all black tattoos that is done correctly and you can actually see the amount of detail it has this is also a gorgeous tattoo and has some realism to it as well. 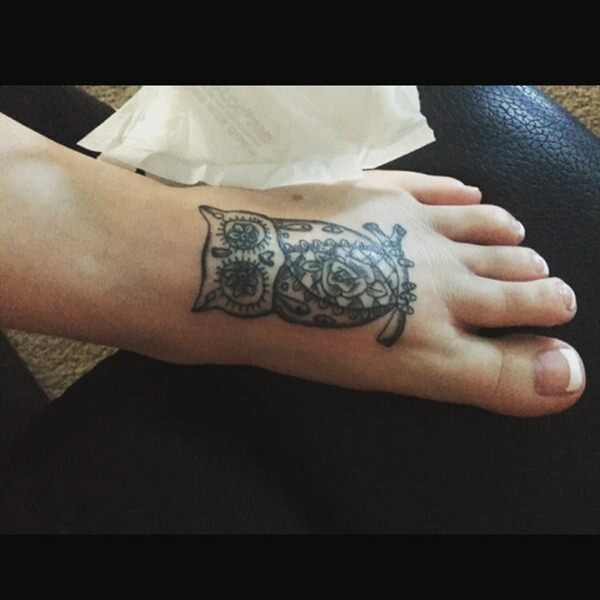 Small owl on your foot with all the design choices I’m sure that you can get something awesome and this one looks great on her foot it is not over done but the detail is beautiful. 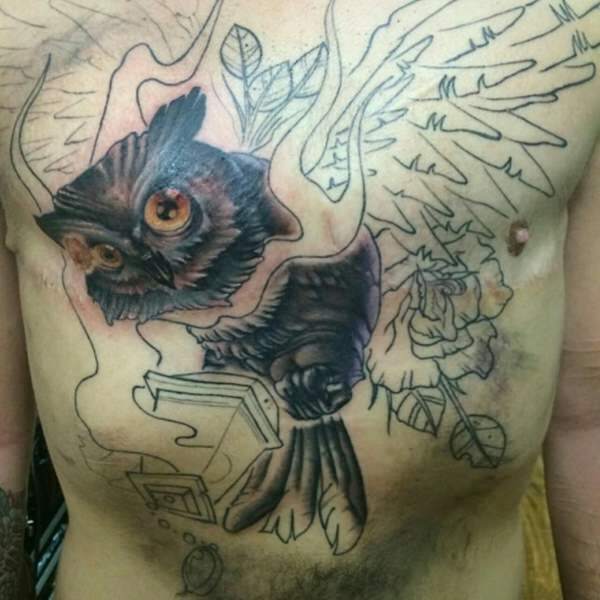 This might still be a work in progress which would make sense because the tattoo will make a lot more sense but maybe that is only my opinion. This is quite small but the black and white looks so great and if small is what you are looking for it is always a good thing to consider using less colours. 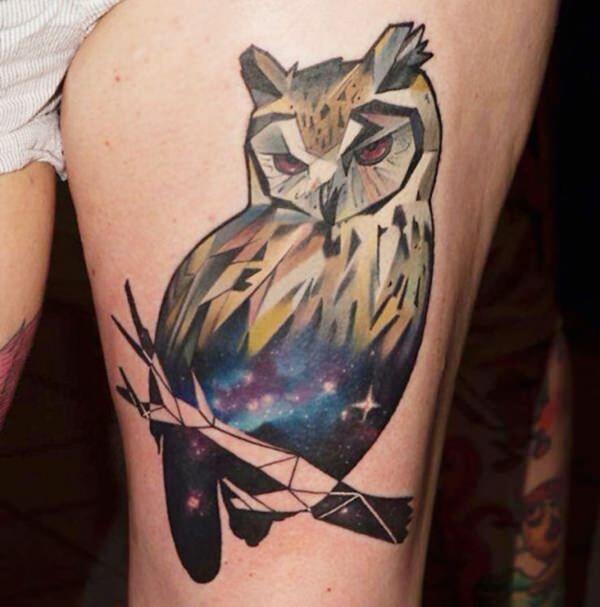 This looks a little like one of those owl status carved out of wood the artist did quite a good job capturing the craft like effect as well as the universe effect the bottom it is one of those designs that will catch your attention. This looks like one of those old owl drawing done by the native Americans it is so gorgeous and the details look exactly like those of all the drawings this looks amazing and captures the picture perfectly. 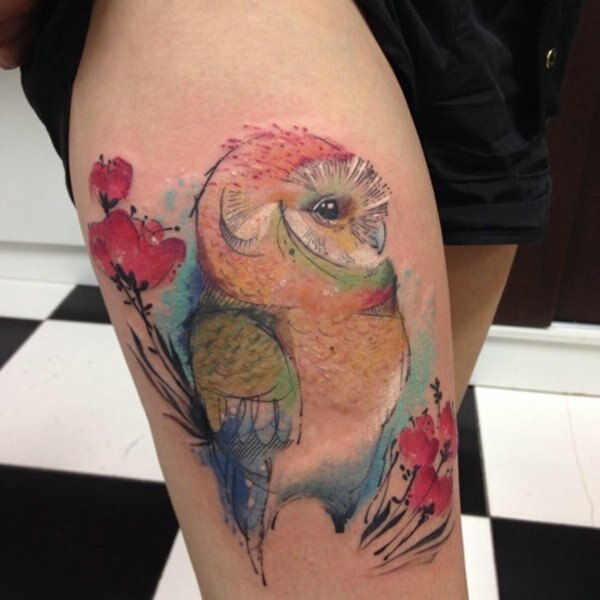 This is so beautiful and well done the drawing is excellent and vibrant. 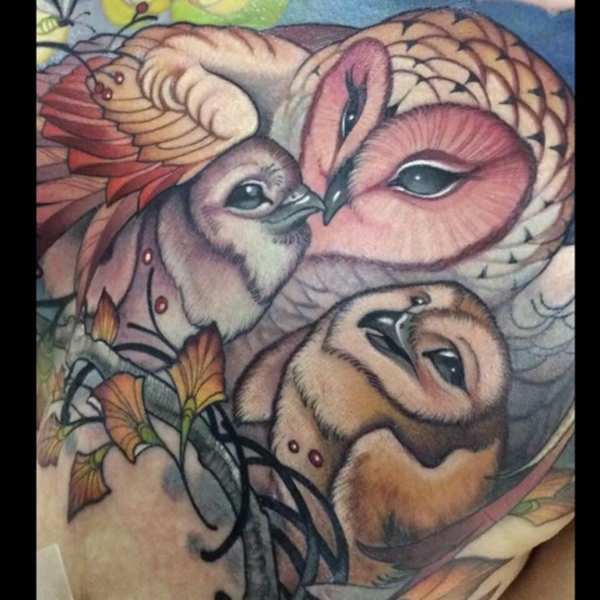 This is a beautiful design and for all the owl lovers out there you might want to get this if you have kids as this will symbolize family. This is a bot more of a dark design it is still done well with the eyes looking like the moon but it also has the scary element. 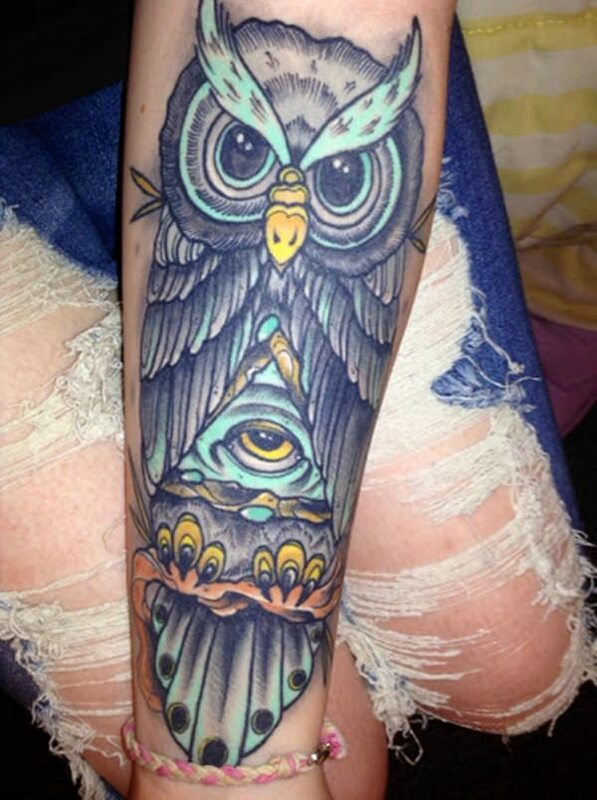 Those eyes is just gorgeous although I would’ve probably left the blue out but this design is something I think most of us can agree that this is beautiful and something to put in your list of designs to consider if you are planing on a owl tattoo and I am sure this one can even be made a bit smaller. 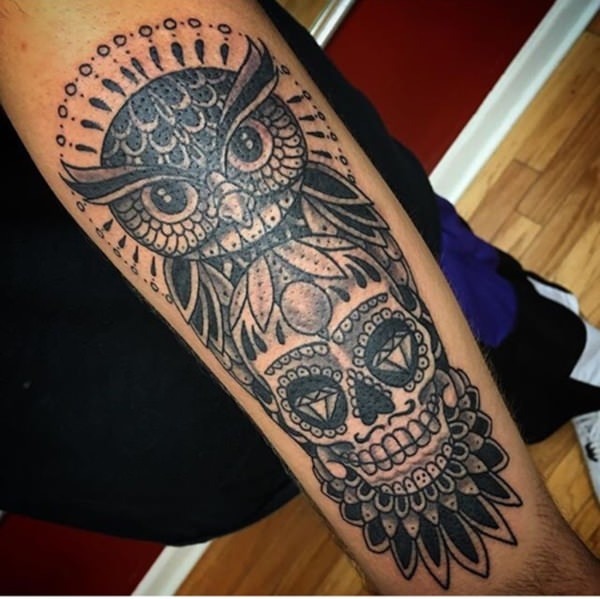 This owl tattoo with the day of the dead skull is quite detailed and it is great that they did not add a wide range of colour this would’ve taken your focus off of the design. 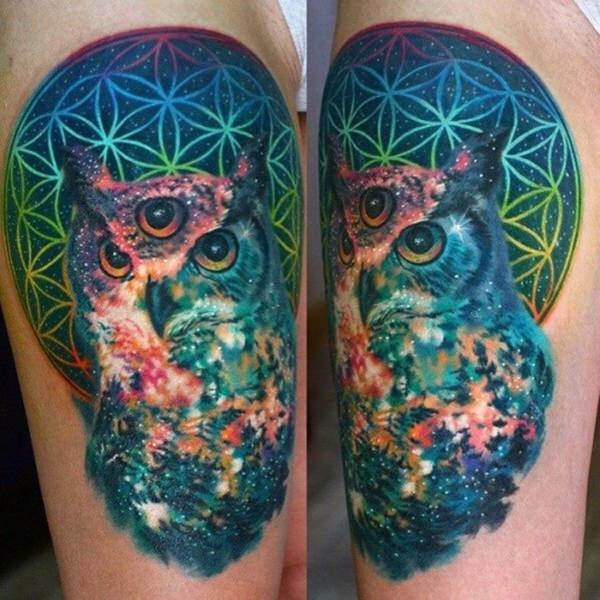 This is so colourful and beautiful and you can see the background has a lot of detail the owl itself looks so interesting this is a great design and it is so very unique. 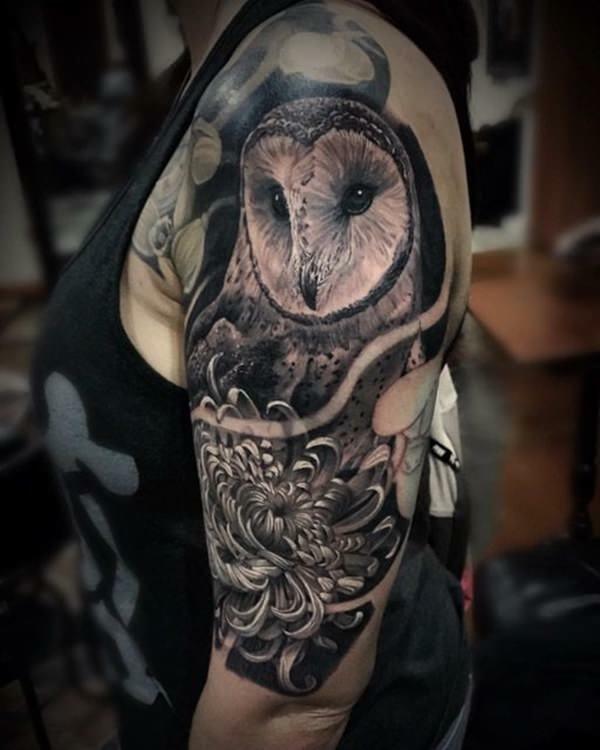 great detail with this flower the owl stands out and the detail on it is great and the little bell just adds so much more to this design when you get a tattoo the small detail is always what takes your design to a new level. 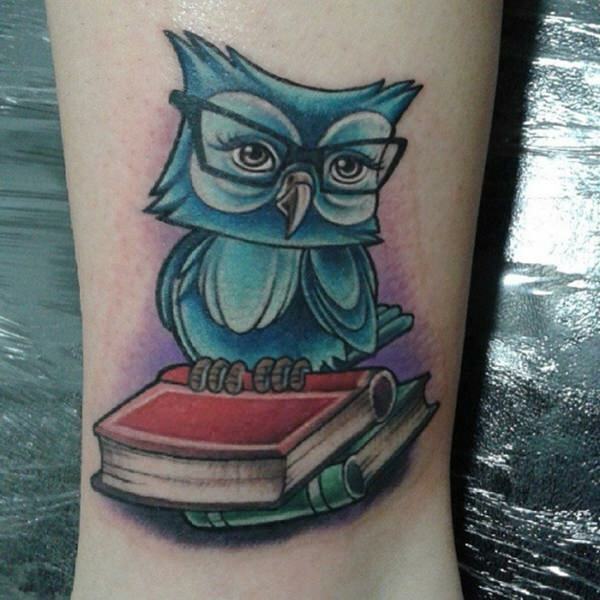 This little reading owl is one of those fun designs that is quite cute. 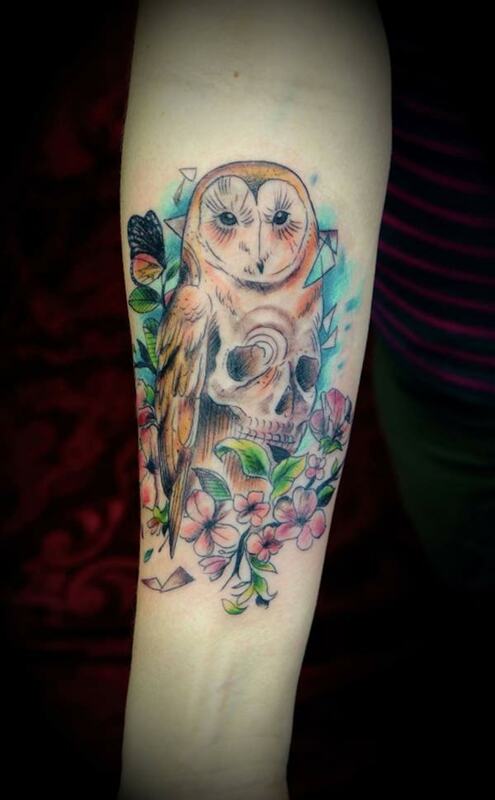 Okay this is so beautiful it is done beautifully and looks so clean if that makes sense the detail in this is also good and the owl looks well smart which is what they symbolize which makes this design just great. 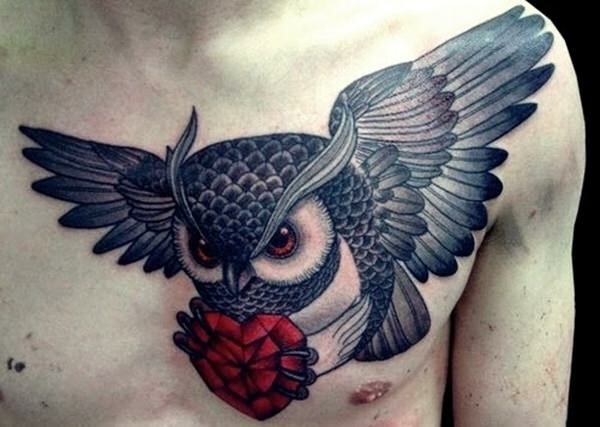 This is a detailed key design the ruby eyes and beak rally makes this stand out, it takes a small while to actually see the owl but when you do it is beautiful. 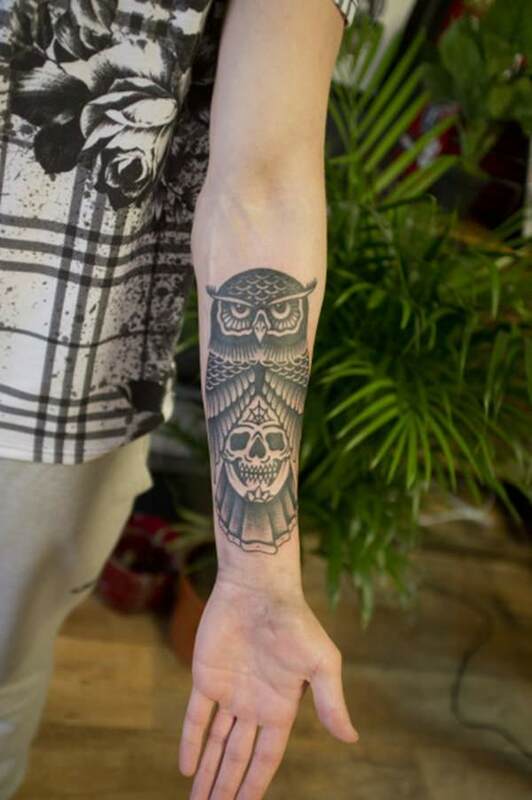 This is a really nice small design it has little detail but this is why this is one of the best small designs when you get a small tattoo with a lot of detail it will take away a lot of the look of the tattoo. 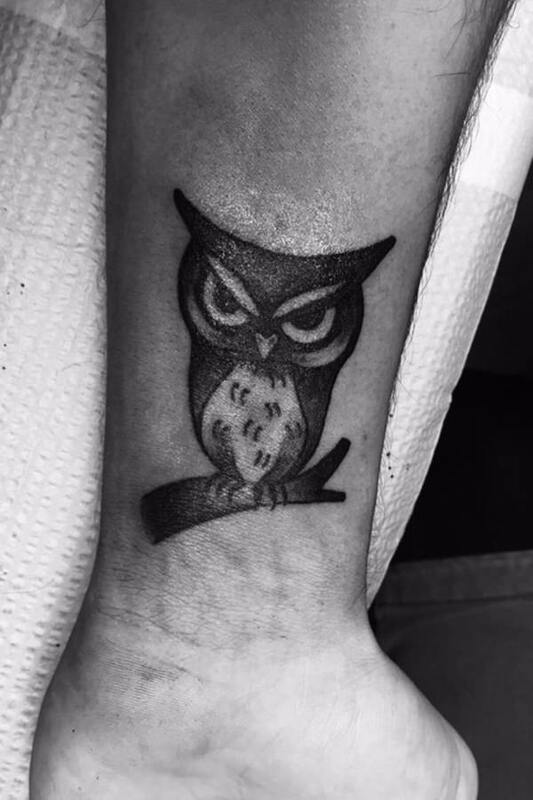 This owl looks a bit evil and the black design adds to that it is a very simple design and will not take all day at the tattoo shop to do. 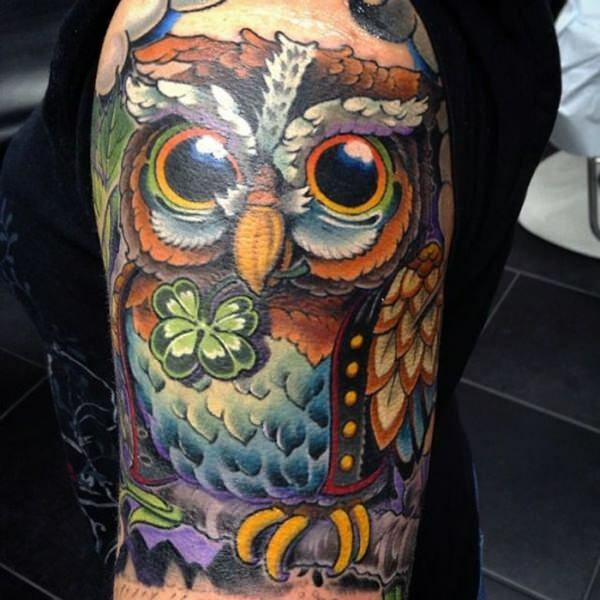 This is one of those amazing designs were the owl is standing out the details are perfect and the colour is just amazing this is one of the designs that you might want to add to your list of considerations when it comes to tattoos. 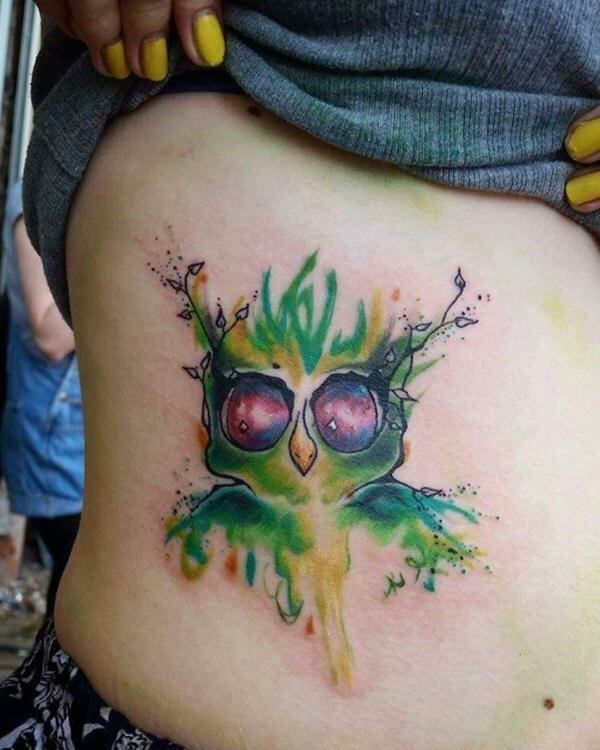 Can you say Wow because that is all that I thought when seeing this tattoo it is perfect in every way you can think this artist is simply amazing and the design is so clean and filled in perfectly it is such an awesome design and the colour is just well wow. 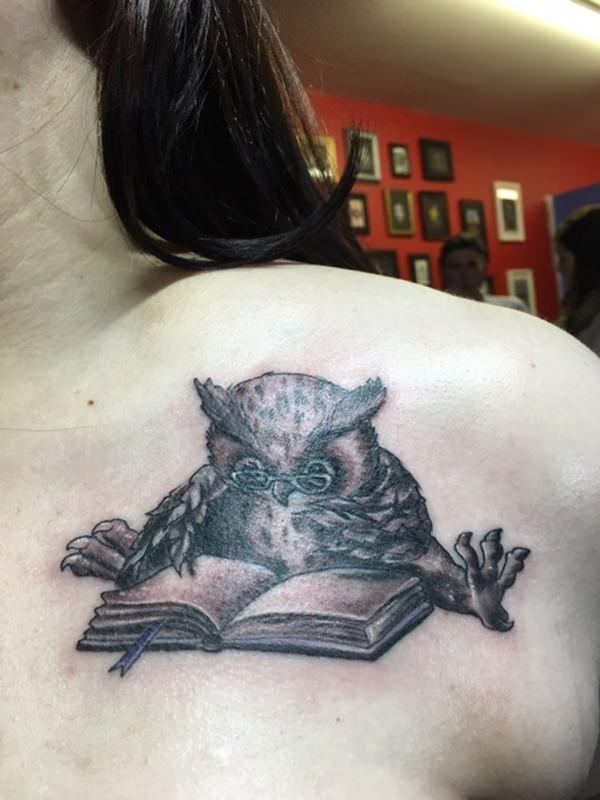 When getting a tattoo you will have to pick a design carefully because once you have it done it will be on your skin forever and yes there is tattoo removal these days but there is never a 100% guarantee that this will completely remove your tattoo. Getting the right artist is also very important especially if you want something life like or 3D not all artist can do this and you will have to find one that specializes in that. Always ask for previews and talk to people to hear what they have to say about the artist as this is not a small decision that you can just scrape off after a few weeks. 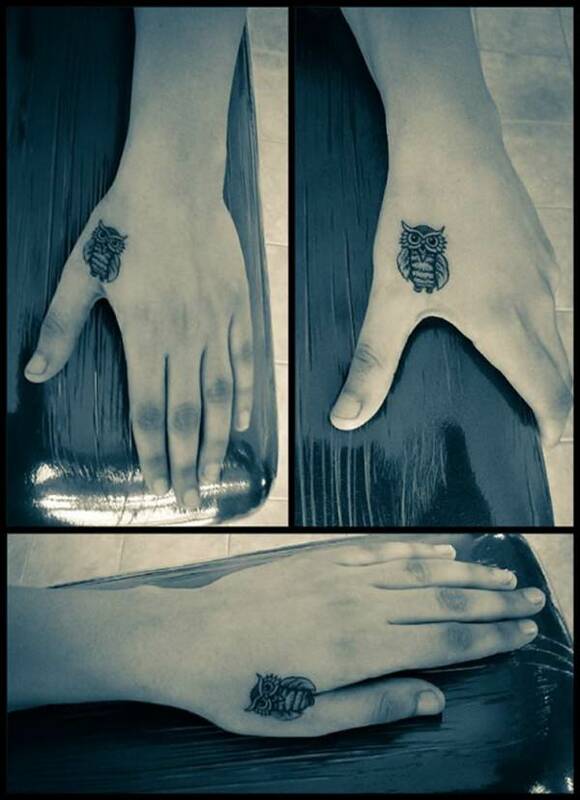 Get a number of designs to choose from before just getting the first design. 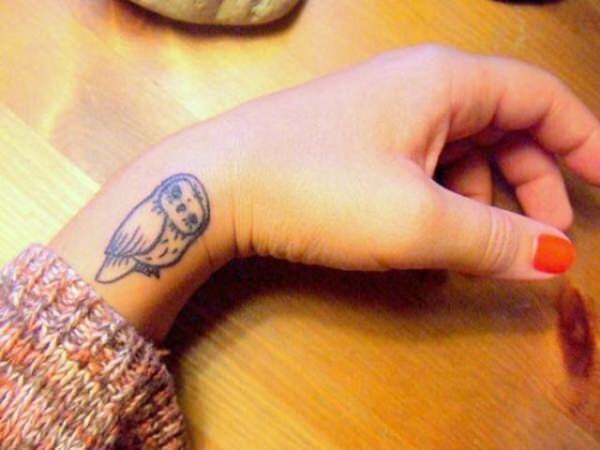 Is A Tattoo In Your Future?